I know this is a global community and I may be talking about a snack or fun food that some of you may not have heard of but … Do you like nachos? I say global but I grew up in Florida (USA) and I never really knew anything about nachos until I moved from Florida to Texas in 1987. That basically means that I was on planet earth, living in one state in the same country, for about 30 years before I knew there was such a thing as nachos. For those of you who don't know nachos is a plate of corn tortilla chips smothered in melted cheese and you throw on any additional toppings that you like: ground beef, chopped tomatoes, chopped green onions, salsa, whatever! Nachos are really popular in Texas. It's a great snack. It's fun food for a party. Have you ever tasted nachos? Is there a snack or fun food where you come from that is similar to nachos? I’m originally from New York City, and I grew up there in 90’s when Tex-Mex food was already quite popular throughout the United States. I don’t know if it was as popular before then, but by the time I moved out there was a Mexican restaurant on nearly every block. I’m not even exaggerating; depending on the community, some blocks even had two or three restaurants. That being said, I personally love all forms of Tex-Mex food. I’m a huge fan of tacos, burritos, and yes…nachos. Unfortunately, a lot of people I know have never actually had a good plate of real nachos, and are only really familiar with nacho flavored things like Doritos. I think if you like one form of Tex-Mex food you’ll like all of them, since they all basically involve the same four ingredients: tortillas, cheese, ground beef, and sour cream. I like nachos. The picture of nachos on the plate looks so tasty. I feel hungry when I saw that picture. I love Tex Mex cuisine and I'm fond of Nachos, well I really like Tacos better but Nachos is a close second. Give me a Nacho Platter and some Beer and I'll be happy. Nachos is a great finger food or drinking food. It's also a good well balanced snack with the all the meat, cheese, beans, veggies in it. It's a complete meal on its own. I actually prefer tacos myself, as well. I feel like they’re a lot easier to eat than nachos, because with nachos you sometimes have to go around grabbing the different ingredients in order to get a bite of everything. With tacos, you get everything with each bite. I actually have a specific way that I like my tacos. I like them with a classic hard-shell tortilla, and filled with ground beef, lettuce, diced tomatoes, cheese, and sour cream. Then you take a soft tortilla, spread nacho cheese on it, and then wrap it around the hard-shell taco. Not only does it taste great but it helps keep all the ingredients from falling out. I wouldn’t eat it often because of all the calories but my god is it tasty. I agree with you, those ingredients are really popular in mexican food, I tried fried tacos ad soft tacos and both have those four ingredients. Gosh! I love hearing these four combined, tortillas, cheese, ground beef and sour cream. They make me crave. I love nachos! Me and my boyfriend went on a buffet on a restaurant and I was so happy that they also offer nachos in their buffet. I really like it when it is topped with beef grounds and a lot of cheese. It's really great for parties and movie marathons. Similar to nachos for me is cheese flavored potato chips. They're quite taste the same but nachos are really different if it is topped with beef. I really love nachos. I agree with you. I also love nachos. I like spicy nachos. I'm not a fan of spicy nachos, actually I don't eat spicy foods. But I still love nachos. Whenever me and my boyfriend got nachos and he wants to eat it with a spicy sauce, we would have it in separate plates or else we'll get into a war, just kidding. Good thing that you also love nachos. I am not fan of any spicy foods. I feel like my mouth and tongue is burning whenever I eat spicy foods. I never tried spicy nachos ever. For me the moderate spicy food is good. But when its very hot and so spicy my ears is getting red. My eyes are also getting misty because of the spiciness of the food. Spicy food is good for the metabolism. I dont like spicy foods because of its uncomfortably taste. I prefer without it in my foods so that I would enjoy it very much. I agree with you, nachos are really delicious, especially if the cheese is really good. I believe cheese is the best partner for nachos. I agree that incorporate it with good cheese can really sum up its taste that will make you wanting for more. We just ate nachos last week because of this thread, and I really appreciate the cheese that we chose to eat nachos with. I can say that nachos will not be complete without it. Well, I like nachos as an appetizer or snacks while watching movies. Sometimes I don't like the smell of the sauce but It really tastes good. I'm not into Mexican Restaurant but one time I have tried this Mexican food restaurant and one of their menu was nachos. Their food was great especially the ribs and the Nachos. I really like their nachos but what I really don't like about it was the smell of the tacos. I don't know. Prefer not to breath while eating. Just kidding!. Nachos are beer food in my country. Most bars serves different variants of this snack, and I love the spicy ones with lots of cheese and chilis. Here we have a Nacho Pizza which basically is a giant Nacho chip with lots of toppings, it's like a crunchy pizza and it taste awesome. I think it taste good. I haven't tried the Nacho Pizza but I would love to try it. I wonder where can you buy those Nacho Pizza as I haven't heard of any advertisement here in our place. I love nachos and we have here in our country. This food is just great if you want a snack while having fun with your friends. Nachos are just amazing, I like the idea of chips topped with veggies and delicious sauce. I think I want to buy this food tomorrow. I think you got some cravings about nachos huh,me either. I really like that snack foods. You can serve it in party or even in the huge celebrations as finger food. I liked how the meat blended into other veggies. It is very delicious and healthy as well. You are right! The combination of meat and the veggies are just perfect! My favorite nacho consists of cheese, onions and jalapeño peppers. The person who invented this food is so great! I cant wait to go outside one of these days and find someone who is selling it. I cant wait also to taste it again. The great thing is that you can easily find at the mall. Lots of people enjoy having it while walking. It's common to see people eating nachos as they're enjoying their weekends outside. You can purchase nachos at malls. We bought it at the Foodcourt, I just forgot the name of the food stall that sells Nachos. But I am sure that you can find it somewhere since a lot of people love it and more sellers offer this kind of snack. I will definitely find that store and buy it immediately. I love to taste the authenticity of its original taste but I am open also for some upgrade. I'm happy to know that as well. Nachos have become as much as a classic as french fries. They're also often eaten with melted cheese. It tastes really good. Yeah but I prefer Nachos than french fries. Other fast food also came up to the idea to upgrade the taste and flavors of french fries. They added cheese and honey flavor to it. I am one of the millions of people who love nachos. I personally think that eating nachos while watching movies or TV shows somehow relieves stress. It's like a temporary happy pill. I love eating too much nachos with the right kind of sauce, I sometimes experiment with what to pair with it. Whatever the results are, I still love the taste of it because of the presence of Nachos. I live in the United Kingdom, but Nachos are fairly common here thanks to the proliferation of International Cuisine. I mourn the demise of a Mexican shop by the bus stop in town where I could stop and have a cheap meal including Nachos. Somehow they are not the same when served up by a pub chain like Wetherspoons. I only get to try nachos once when I was out drinking one night with my friends at a bar in the city. Personally, its excellent comfort food, but I am not a fan. It is like pizza, the pieces of nachos act as the dough and topped with beef, tomatoes, onions, etc. I'm sure that's the idea. I've heard of nachos before though I'm not from the US. In my Country there is a Mexican place that serves them. I actually have them about every quarter. I actually love them. They taste delicious. I try to live a low carb lifestyle and I love the fact that though they have corn tortilla(carbs) they have plenty of protein. I love, love, love ground beef. I think it is one of my favorite foods ever. So having nachos is pretty much like heaven. Who doesn't want a nachos? I will proudly say that yes, I do love nachos, I also love to eat it with a lot of cheese and some ground meat. I would love to eat it with a beer. I like Nachos. I usually ordered it in some fast food chains. I prefer having lots of cheese and tasty toppings. It's a great snack for parties since everyone seems to like it. In fact, it's probably the one that runs out first. We call it flakes in our country. This is one of the snacks that I always enjoy when I am bored and feels like taking something that is quite okay. The important thing about it is that it has high nutritional value which will make you feel hearty in the long-run. I heard about nachos through a Hollywood movie. The central character was named nachos, I don't remember the name of the movie though. Later, I saw an ad of nacho on TV, then only I knew it was a name of something to eat. Since I do not like to munch chips because of extra calories, I did not try nacho for a long time. Then one day when I was in a supermarket with my nephew, he asked me to buy a packet of nacho. When I tasted, i really liked it. You learned about nachos watching a Hollywood movie. I learned about samosas watching a Bollywood movie. I would love to try samosas. We don't have a lot of Indian restaurants in Texas. But since our Indian population is growing, I think we will soon have lots more restaurants. I am from the Philippines but I am not familiar on that kind of food called nachos, it seems great and delicious to have since it is very attractive but then I haven't tried it yet. If there is only one restaurant that is selling such kind of delicacy in my location then I might buy it since I love all the toppings in it. It really looks yummy and very delicious. 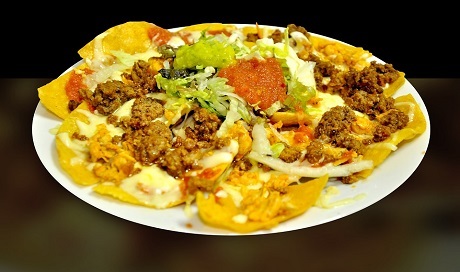 Some beer-restaurants in the Philippines sell nachos. If you head over to a bar that serves alcoholic drinks, there is a chance that they have it on their menu. To be sure, I know TGI Friday's has Ball Park nachos for PHP 375 per order. Well that is great, thank you for giving me an insight since it would be my guide whenever I have the chance to go to the a particular bar and I would surely look for nachos since I am curious about it. It seems like the price of that food is really good, it looks fine and very attracting, I think maybe it is really worth it to have for that particular price. Who doesnt want Nachos by the way? I like it very much. When I saw the photo attached I was thinking to prepare one because I honestly craving to it. This is one of my favorite snacks. It is very delicious and easy to prepare. It can be served in any kind of occasions. I love Nachos as well. Especially with lots of cheese. It can be a bit expensive to buy it from restaurants so what we did at home is to make our own version. A version where we can buy all the ingredients in a supermarket, Nacho chips and ready made dip. Nachos are a staple in any cafes you visit here in the Philippines. Though some are not great, it's a great finger food you have with friends hanging out. What I don't like is when cafes/restos just use those tortilla chips you buy in the supermarket. Worse, Doritos. If you can make it at home, why bother serving it? On that note, why even charge $3 for the damn plate if you made it for less than a dollar? At least put some meat in it to make it worth the price tag. I love nachos. There are a lot of shops here that have it on their menus. I don't often buy those because I would choose other food on the menu that would satisfy my tummy better. I would only order these during snacks. I remember we were taught to make nachos when we were in primary school and we couldn't wait to have our teacher give it a grade because we want to eat them already. Nachos are good as long as they're prepared properly. Only a few places can do that, mostly states in the southwest since it's a food native to that part of the country. Some places here on the East Coast can prepare great nachos too. But you should try and avoid places that just slab melted cheese or liquid cheese-looking substances onto dry chips and call it nachos. Movie-theaters for example. Nachos has no taste, tho it will add some taste to if you put some cheese on every bite, so it will become better. Nacho are not that known in our country. But I've tasted it once and I can say it is a bit bland without the dips but it was ok, or maybe I am bot used to the flavor it holds. I grew up in a country where snacks are pretty much welcome because people love eating and they always go for something that will make their tummies happy. My country, the Philippines, has been a tourist destination for other foreigns because of its beautiful and wonderful tourist spots. Some tourists really fell in love with the country and some of them also fell in love with the people. Some of these tourists introduced Nachos in my country. Filipinos love to eat spicy, sweet and even food that are new to their taste buds. I love eating Nachos because I can definitely say that it is a comfort food for me. I love the combination of the tortilla chips, melted cheese, ground beef, tomatoes and salsa! I love nachos, putting cheese sauce in it makes it even better and it's the perfect meal when watching a movie or playing chess. The crunchiness is my favorite part, it's so tasty and delicious but sometimes it gets messy. I am a complete foodie and Nachos is one of my favorite dishes. I have tried it several times and I am always eager to taste Nachos whenever I get an opportunity to taste them. I am originally from India and there are many dishes which are similar to Nachos. One which is very similar to Nachos is called " poorie chat "which is very popular in northern and Western India. the poorie is made up of refined wheat flour instead of corn flour. Thanks for mentioning "poorie chat". I looked it up and it was super easy to find 3 recipes on YouTube, The spelling is varied (Puri Chaat) but the dish looks delicious! Well I do like corn tortilla chips. I love beef. I do love cheese. But I could do well without tomatoes but they are alright. It they are still Nachos even without tomatoes, then yeah I like Nachos. especially like those with sliced chilies and mustard. I love Nachos! Beef or Chicken Nachos! Even Cheese Nachos are delicious! I guess that I cook Nachos about once a month or more often at home. I like everything that I can get on my Nachos. You name it, sour cream, salsa, cheese, loaded down with the meat, lettuce and sometimes I will put jalepenos on my Nachos. Yum, now I want a plate of Nachos. Nachos are actually a great party food! Set up a nacho bar, invite your friends, pick a funny movie to watch or play some games. In fact, you could each person you invite to bring their favorite nacho topping. There are all kinds of ways to enjoy fun food! Nachos is nice food that I have not tasted. It seems good food. I have eaten chips or what we call French fries. In my country it is only chips in tomato sauce and a bottle of soda. Actually it is junk food where I come from. I have tried nachos. There is one store that makes them. And also there is always Lays that produces some good quality of nachos. I have yet to try the nachos from some resto though. I mean not a lot of them are made here. Because we don't have much spanish public around. There's a food stand here called Nacho King and it's in all our malls. They serve different kinds of Nachos and I usually buy nachos whenever I'm going to watch a movie. There's something about tomatoes, beef and cheese on a crispy Nacho chip which is addictive. I like nachos chips with beef it is an extraordinary delicious with beef and mayonaise. I regularly open a pack of tortilla chips and complete the entire sack before I know it, while dunking them in cup of mayonaise and put beef on top. It's only a decent, plain, salty flavor. It's extraordinary in case you're wiped out and haven't got a craving, yet require nourishment. Cheese isn't really the best decision for your nachos, either. I get a kick out of the chance to avoid the cheese and go straight for mayonaise and beef on the top. I think I would love nachos because it has some cheese and beef toppings in it which are one of my favorite. When I first saw the picture I was telling to my self that this particular food is really delicious and seems to be addicting in its nature. This would be my favorite snack in the afternoon if I can only have it everyday. Some people might actually eat it every day. It's important to remember that we should have balanced meals. This could be a little treat we have a few hours after eating. Much better than buying junk food. I could never eat something every day. I mean, unless I had to like in a zombie apocalypse or some other disaster where I couldn't leave my bunker or something. But even in that scenario, at some point it would become tedious. I feel the same way too. I love nachos but eating them everyday, I think, is too much. I might hate it if I do it everyday, unless I don't have a choice. Movie watching at home is better when you have Nachos to share. Just make sure that you have enough because the taste can be addicting. Once you start munching on them, it is hard to stop yourself from getting another one. It is actually served as a snack but for a nacho full of ingredients, it can already be considered as a main dish that is heavy on your stomach. I know right? Tortilla chips are readily available in some supermarkets. The cheese dip and salsa too! I find it the ultimate movie snack. I just have to pour the condiments into a bowl and I'm set. I agree. No wonder they serve this near movie theaters. It's a really nice snack to get before watching a movie. The only thing is that you should bring tissues. The fingers tend to get sticky with all the cheese and other stuff added. I've also had it as a main dish. I had it along with fresh salad. Makes for a crunchy added dish. I love nachos! To me they’re quick and easy to prepare at home, and they’re a bit of a comfort food - cheesy, meaty, delicious goodness! Of course, they’re not exactly healthy so I don’t indulge too often, but when I do I enjoy every mouthful! To answer your questions, Yes I've eaten Nachos. Yes I love the taste and texture of Nachos. And Yes we have a lot of Nachos here in the Philippines. We have one variant here in which instead of using a corn based Nacho Chip, a Chip made out of Cassava Chips is being used. There's also another variant in which Rice Chips are used and I prefer Rice Chip Nachos because it's tastier and has the right crunch to it. It's my daughter and my favourite snack. We love to eat this every time we go out with family or whenever we watch a movie, nachos is a much for both of us. Whenever I'm not in a mood they what food to offer just to make me feel better. The meat, the cheesy cheese, the red sauce, tomatoes, a little veggie on the top and don't forget the hot sauce. I hope I still have box of nachos at home. Nachos is not really my favorite food but I like its taste. I was born in a place where nachos is not familiar. I haven't eaten nachos until I was 20 years old. Nachos is very popular here in the Philippines, it's most likely eaten with some beers, and also nachos is not complete without lots of cheese. There's a store here im the Philippines that offers nachos, the name of the store is Naughty Nachos, it taste really good and its worth to try it. Nachos are actually pretty healthy it's a combination of the main food groups. It has meat and cheese for protein, corn for carbohydrates, veggies and even fruits for vitamins and minerals. Depending on the ingredients it could be pretty healthy. How could you not know about nachos? Yes, I like nachos. Now I bought boxes of nachos make sure I have stocks in my pantry. Some of my friends always give me home made salsa and it so good that I can even wanna eat it alone without the nachos. But if we have sleep over with family and friends, if I'm out of salsa I make sure I have Tostitos salsa available in the fridge. I haven't eaten cheese prepared in such a way, so I'm definitely open to trying such. What did you even call it... Nachos? I'm definitely going to see if it would be on the menu of the restaurant I would be going to this weekend. Please humor me, how does it taste with the way it's prepared? I really love eating nachos, especially if it is paired by a beer. It is a resistable dish that once you've tasted it, you can no longer turn your back on it. Nachos is enjoyable to eat when you are watching a movie or having a karaoke with your friends or family. I preffered Nachos with a lot of cheese on it because it is delicious. I like eating Nachos occasionally. The first time I had nachos was at a bar where my office mates and I waited for the heavy rains and flood to subside. It was great with Tanduay Ice and the bar's signature choco cocktail. It was easy to guess what the ingredients were so I tried making it at home. I bought a huge pack of cheese-flavored corn tortilla chips from a factory near the office and prepared the toppings. Okay, I cheated. I bought ground beef and used McCormick Taco Seasoning. I sprinkled lettuce and grated cheese over it and it smelled and tasted perfect, perhaps even much better than the one I had at the bar. For all the nacho lovers, mark the date on your calendar. November 6th is National Nacho Day. To celebrate you might want to try the recipe for "Loaded Chicken Nachos" (yellowblissroad.com/loaded-chicken-nachos/) or the one for "Nachos Supreme" (delish.com/cooking/recipe-ideas/recipes/a51518/nachos-supreme-recipe/). Enjoy!! I love the conventional nachos with meat, salsa and cheese. There's a place here where they offer nachos for dessert. It has ice cream and nuts. My nieces love it. How can I not? Nachos, and Mexican food in general, is so delicious. The best thing is that nachos, tacos, burritos and more can be easily done by yourself, as the ingredients are easy to find and cook. I mean, c'mon, nothing better than a plate of nachos with melted cheese and ground beef! Oh yes! I love nachos, they're amazing. I would skip school lessons to go to a nearby shop in order to get them. Sometimes I even used to go to school in order to buy nachos (it was the only location in my city selling nachos), and the school was far away, like 2 hours of driving. I love nachos so much. It is one of my comfort food actually. I even search the recipes on how to make one since it is quite expensive. I grew up eating that! Nachos! When I was in high school, that's my favorite snack during break time. I also eat it once in awhile. I usually buy it outside or when I have extra time, I make some at home. I have good recipe of this. It's also nutritious with all the mix of vegetables, fresh tomatoes, cheese, beef, mayo, tomato sauce etc. I also love tacos. I love Mexican Nachos and Tacos!